The Department of Education has decided is provide enough support and help to the teachers and pupils to improve the secondary education. A supporting mechanism which is linked variously at school level and state level has been planned. Has to arrange the academic activities of the school. Delegate responsibilities to his fellow teachers. Organise; subject councils. Subject councils should meet once in two weeks. Evaluate the activities of the subject councils. Make available necessary learning materials and supporting materials (Handbooks/sourcebooks, etc.). Make the lab, library activities more effective to transact the curriculum. Organise school Examination Board and make it functional. Make arrangements to keep the portfolio of pupils. Evaluate the classes of teachers atleast once in a term. Evaluate the progress of evaluation strategies once in two weeks and send the report in the prescribed format to the DEO. (Appendix 5 Fl). Make use of the service of Educational level monitoring committee. Make class P.T.A more effective. SRG is a forum for discussing and resolving academic problems faced by the teachers. There should be a convener for SRG. Keep minutes of SRG meetings. Meet once in a month. Discussions on academic problems should be solved class wise or subjectwise. May also discuss instructions from Educational district level subject council, official messages, guidelines and matters for which clarity is sought from Educational District monitoring committee. And concepts received from training programmes and matters to be raised in training programmes. This is a forum for the teachers who teach (he same subject. Meet once in two weeks. Maintain minutes of the council meetings. Teachers should clarify matters related to evaluation. Has to assign responsibility to teachers to prepare question papers for the testpapers. 4. 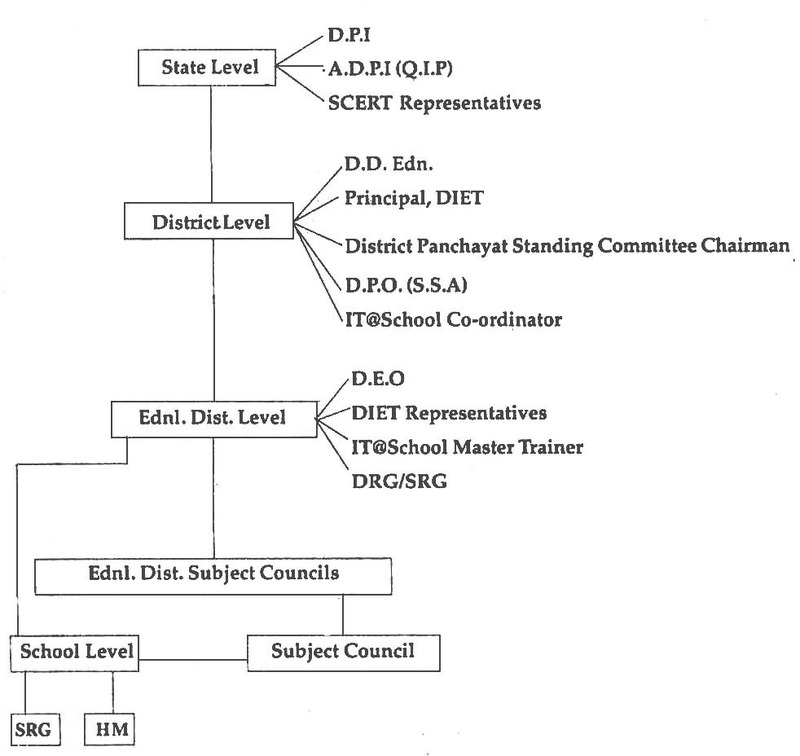 Educational district level subject council. Educational District subject council consist of all the teachers who teach a particular subject. There should be a convenor. May seek academic help from SRG/DRG/DIET representatives. Subject council should meet once in a month and evaluate the activities, plan follow-up activities too. May arrange convenient group of 50 teachers to conduct meetings. Till then, the team of convenors of school subject council may organise meetings. Work report of subject council may be sent to the higher bodies. Government has formed monitoring committees including representives of DIET, DRG, SRG under the leadership of DEO. EDCC is formed addings 13 members more to the monitoring committee. It includes DIET faculty members, SSA trainers (HSAs), DRG members and IT. ? school master trainers. This committee should meet once in a week to analyse the findings of schools visits. Helps to solve the problems faced by schools related to learning and evaluation. -------- give necessary guidance for time bound execution of CE measures. ------ Prepare weekly CE progress report in the prescribed CE format. Making available Resources teachers / tools etc. Discuss and evaluate CE progress attending SRG meeting. Evaluating CE products on different subjects at random and ensuring that it proceeds in the right direction. Recording the findings in Appendix 5. Format II and forwarding it to District core committee. Arranging school visits by groups of 2 or 3 to one school on a day. It is the responsibility of the EDCC to deal with the complaints from schools related to CE, portfolio items are to be examined at random and the correctness has to be ensured. The committee consisting of DDE/DIET principal/ DPO (SSA), IT @ School District Coordinator, Chairman of District Panchayat standing committee will coordinate the activities at District level. Core committee members will also participate in EDCL meetings DCC meets once in a month. Necessary policy decisions may be taken and issue administrative guidelines. Visit schools having problems and suggest remedial measures. As per GO. No 298/04 Dated 24/09/04 School Committee consisting of Headmaster and subjects experts in the subject concerned has been formed. Educational District level monitoring committee has also been formed. This body and Educational District core committee are one and the same. Step may be taken to redress complaints as per the circular of DPI date 30/09/04. Evaluation score sheet of CE should be published on the notice board towards the end of January. Complaints, if any, should be submitted within three days and the school committee headed by the Head Master should take proper decision on those complaints. An appeal against the decisions may be submitted before the Educational District Appeal Committee headed by the DEO with in seven day and a decision should be evolved within three days. A further appeal may also be submitted against the decision of the District committe before state level appeal committee headed by in the concerned DPI within three days and a decision should be taken within five days. When the score is published on the notice board date for appeal also should be mentioned.